A few days ago, WWE announced what to me was probably one of the most exciting pieces of wrestling related news I had read in a really long time: Akira Tozawa was going to be a participant in the upcoming Global Cruiserweight Series. In case you haven't seen my description, I absolutely love Dragon Gate, and the announcement of his participation in this tournament finally gives me the opportunity to talk about this promotion. The roots of Dragon Gate can be found in the Toryumon system, which was established by the legendary wrestler, Ultimo Dragon. Following a botched operation to his arm, which was injured during a match in WCW, Ultimo Dragon announced his retirement and transitioned into a trainer role. In order to be able to give his students some exposure and to let them grow as wrestlers, he established a series of promotions called Toryumon Japan, T2P, and Toryumon X.
Toryumon Japan and T2P proved to be a success at the beginning, drawing crowds like no other junior-based promotion did at the time. Meanwhile, Ultimo Dragon came out of retirement in 2003, working in WWE until 2004. During this time, cracks were starting to form in the Toryumon system, eventually culminating in a split in July 2004, where wrestlers from the three promotions split off from Ultimo Dragon and formed Dragon Gate. What makes Dragon Gate different from other promotions—particularly promotions in Japan—is its tendency to reference the past, a heavy emphasis on storytelling and promos, and its style of wrestling in general. Dragon Gate's roster is filled with wrestlers that would be considered juniors in promotions like NJPW or NOAH, and they wrestle a style called lucharesu, a hybrid style of lucha libre and puroresu. It's widely considered to be the number two promotion in Japan, only behind NJPW. It's important to note that Dragon Gate focuses heavily on stable warfare, usually with multiple babyface or tweener stables and one major heel unit. Obviously, this means there will be plenty of faces but only a few heels. The thing is, the heels stick together in a single unit, usually uniting for a common cause, while the faces are spread out, and usually have their own agenda. Allegiances can be somewhat fluid as well, with defections occurring every now and then, and rivalries culminating in Units Must Disband matches, allowing Dragon Gate to keep heel-face dynamics constantly fresh. One of the major stables in Dragon Gate for the past few years has been Monster Express, a stable formed on the grounds of friendship and enjoying professional wrestling. Monster Express was founded by Shingo Takagi and the man whose match we'll be watching today: Akira Tozawa. 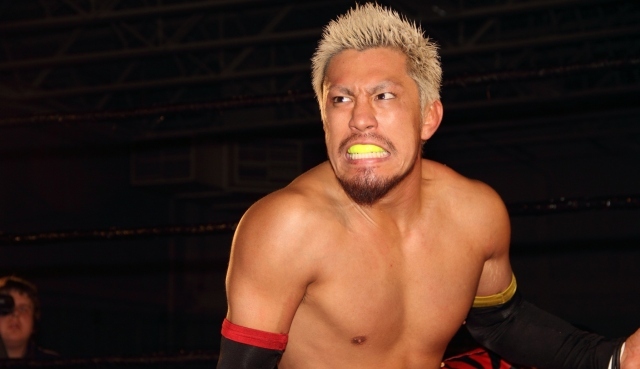 While Shingo Takagi has since moved on from the stable, forming his own heel stable known as VerzerK, Tozawa has since remained the leader of Monster Express. Akira Tozawa is a member of what's known as the first generation of Dragon Gate trueborns, or wrestlers who debuted following Ultimo Dragon's departure. Originally debuting in 2005, Tozawa started off as a bit of a problem child, clearly having the charisma needed to be a major star, but issues of backstage misconduct held him back. He had a pretty low-key career in Japan up until 2010, when he went on an excursion to the USA for a year, competing in various American indie promotions, most notably PWG and DGUSA. His performances during this excursion put the spotlight on him, only in a positive manner now, and upon his return to Japan, he started receiving a bigger push and his charisma began to shine all the more, turning him into one of the faces of Dragon Gate for this era. Despite his popularity and his founding of a stable however, a singles title had eluded him, at least until 2015. While he had been winning Open the Twin Gate (tag titles) and Open the Triangle Gate (trios titles) championships, he had failed to win the Open the Dream Gate (top title) championship four times up to this point and so he set his eyes on the Open the Brave Gate (secondary title) championship, which was held at he time by Kzy. Kzy can be categorized among the second generation of Dragon Gate newborns, and was known for a time for being Dragon Gate's longest-tenured heel (amount of consecutive days spent as a heel), until early 2015, when he turned face. He employs a hip-hop gimmick, and usually is pushed as a lower to mid-level midcard worker, which a shame considering how talented he is. He did hold the Open the Brave Gate title in 2015, however, and defended it in the Champion Gate event against Akira Tozawa. Tozawa is presented in this match as being more serious than usual, and the match starts somewhat slowly. Tozawa makes a mistake, missing an elbow strike on Kzy and hitting the ring post instead, which set up how this match would go, with Kzy working on the elbow and Tozawa doing his best to fight through his injury. The end of the match goes to a full sprint, with awesome pinning sequences and impressive moves, but eventually Tozawa gets the win following his package German suplex. The emotion he shows following the win transcends language, and you can see just by the way he moves how much this title win means to him. To summarize his post-match promo, he talked about how honored he was to win the title, and that he would never let it go. Akira Tozawa wins his first singles title, and much like Shinsuke Nakamura and the IWGP Intercontinental title, Tozawa's title reign elevated the status of the Brave Gate championship—a belt he would hold for 246 days, losing it only due to being put up against two allied heels in a three-way match. Did you like the match? Want to see more Dragon Gate coverage? Leave a comment!